It's really important for me to have the day of the week for a date field in my email notification. How can I format that. It shows up in the back end when looking at the submissions. I'd like that same info in my notification. Thanks! At least the day of the week, if it's going to display like this: 05-05-2016, I'd like it to include 'Thursday', or identical to how it displays in the back end!!! 1. Add a Text Field and name it Day and date. Then click the gear icon on the side and select Edit Properties. 3. Then add this condition on your form. You can get the dateString() function by clicking on the ... option as seen below. 4. 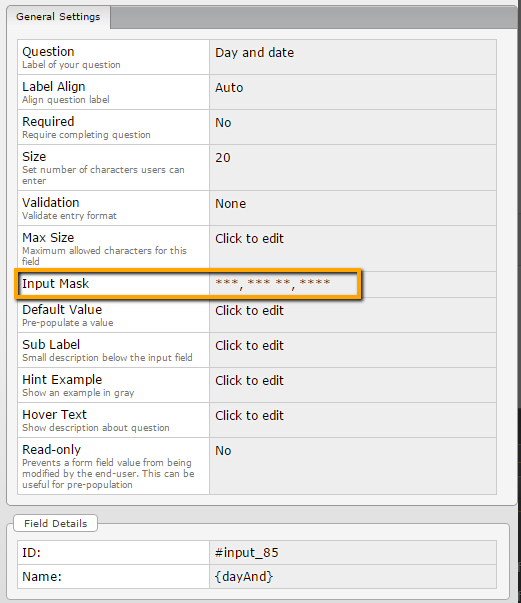 Once you have added the condition, you will need to go back to the ... menu then click Options. 5. 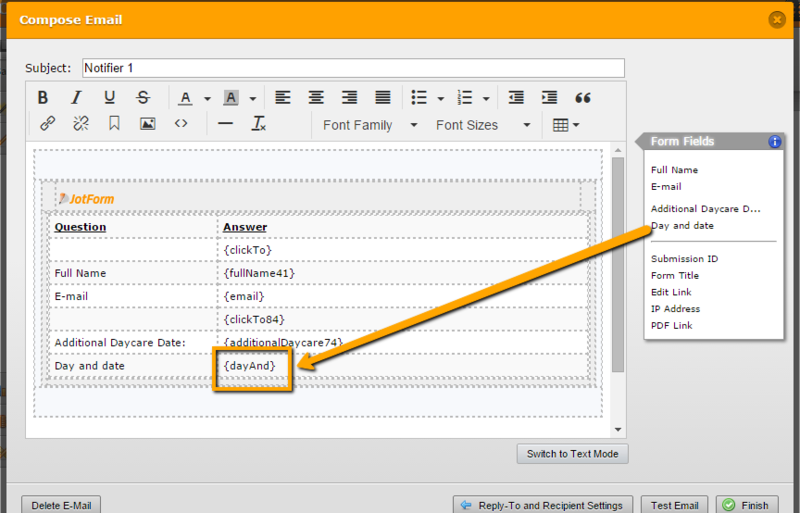 Then check the 'Add field to equation as text by default' from the options. 6. This is how it will appear in the preview. 7. Once you have that setup, you can now have the Day and date show up in the email. I get nothin' in the field anywhere. Pulling my hair... can't find why it's not working! Oh my... in addition to the previous post... I'm assuming that the 'Day and Date' is suppose to populate on it's own with the condition in place if the 'Daycare Date' is filled out. I am right to assume this, yes? It's just not working. Thanks. You are correct. 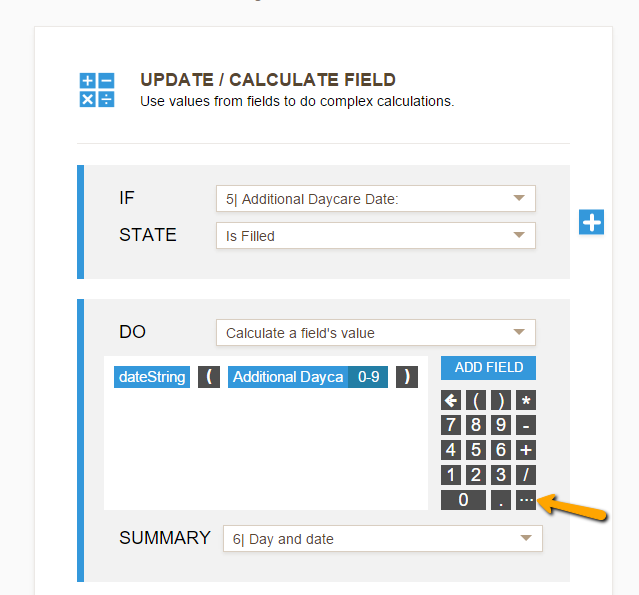 The date should automatically populate the field when the user selects a date on the date field. 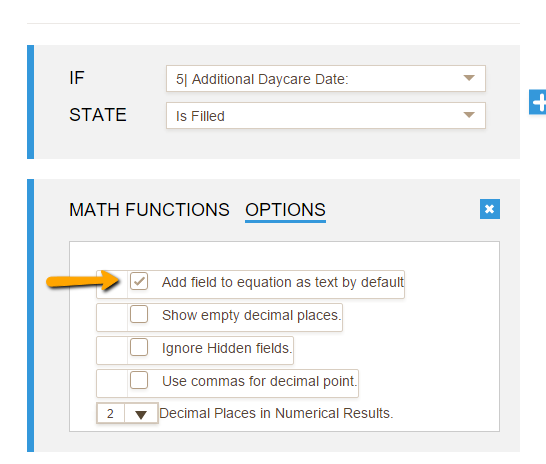 I cloned your form and tested the daycare date field. I can't seem to replicate the issue you're having. 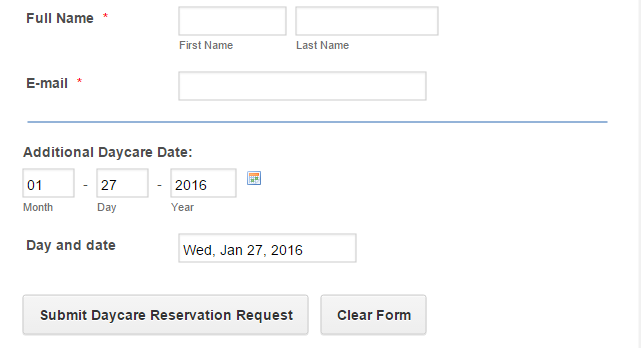 The form was able to populate the Day and Date field without any issue. Can you try checking on your form again? Please ensure that all the conditions are enabled. If you are still having issues, you can try cloning this form https://form.jotform.com/60251264330948 and see if that version works on your end. So I check your clone and then cloned your clone... :)) Yours works, mine doesn't. I compared both and they sure seem to be identical! I'm going to clear cache, reboot computer as a last effort. I'll let you know. Love the animated graphic, I wish mine would do that!Stand by... Thanks! Thank you for your input Alexander. 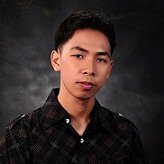 @thepack We will be glad to help you further if you are still encountering the issue with your own form. Cheers. I don't know what to do... I've rebooted and nothin'. 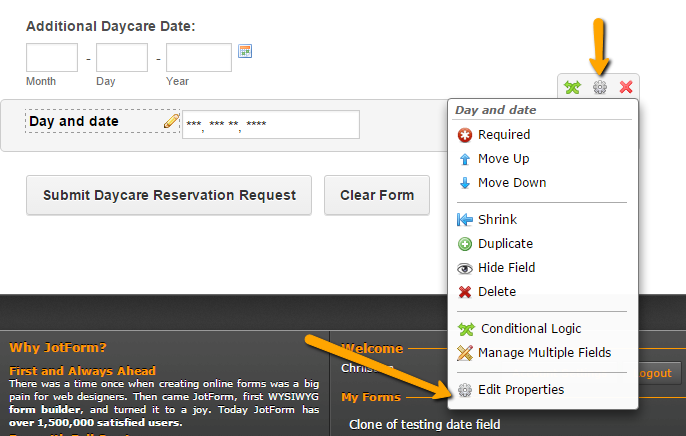 My forms don't work, I've put it into two different forms to check, it works in your clone but not in mine. 'Boarding Reservation Test 1', and the 'Clone of Daycare Reservation test 2'. What else should I do. Can you preview them in my account? They just aren't functioning. At a loss... bummed. Thanks. It seems like the conditions need to be saved in order for it to work properly. Here's what I tried in one of your forms. 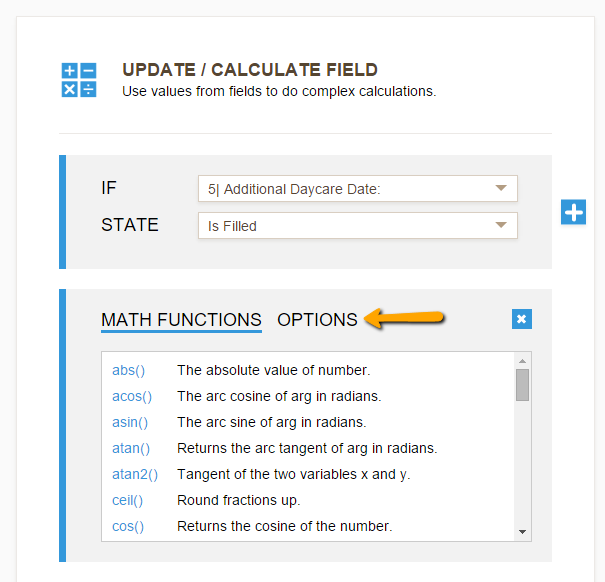 I opened the condition in the day and date field, then I saved it. After I saved the condition, the field seems to be working properly now. Can you check again on your end if the forms are working now? Thank you! So weird that it really wouldn't save the first time around of creating the condition. I went in and tested another test form and then went back in to 're-save' it again and it's working. Whew! Thanks for bringing resolution to this for me... I was dumbfounded, kinda still am :) This was important to me! I'd like to make the suggestion and request of changing the the hard coded format be on notifications with the full day of the week, full month, date and year... that would be awesome. It's so much more professional (it's like that with you biggest competitor, uh-em). You are most welcome. And thank you for your suggestion. 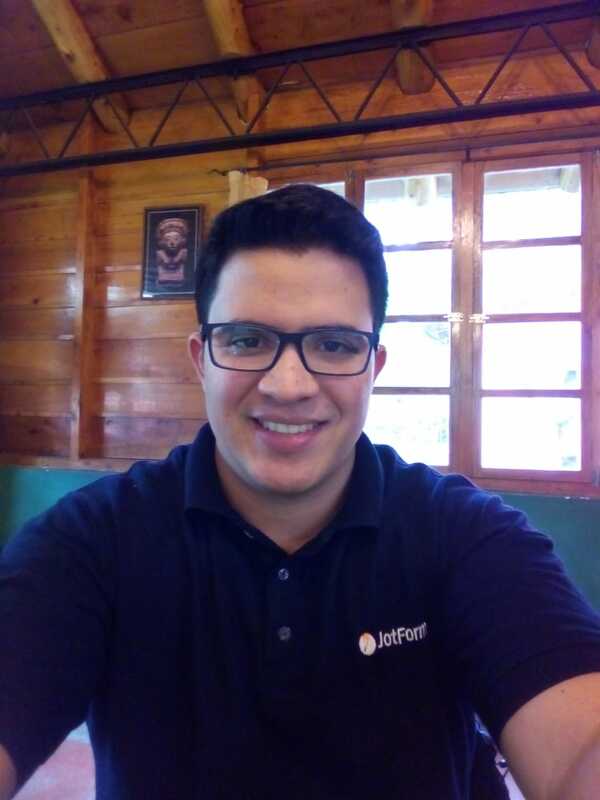 I will send your suggestion as a feature request to our developers and perhaps the feature will get implemented. We will inform you on this thread if there are any updates on your request.